Chamaecyparis nootkatensis (D. Don) Sudw. Cupressus nootkatensis is a species of trees in the cypress family native to the coastal regions of northwestern North America. This species goes by many common names including: Nootka cypress, yellow cypress, Alaska cypress, Nootka cedar, yellow cedar, Alaska cedar, and Alaska yellow cedar. The specific epithet "nootkatensis" is derived from its discovery on the lands of a First Nation of Canada, those lands of the Nuu-chah-nulth people of Vancouver Island, British Columbia, who were formerly referred to as the Nootka. First described in the genus Cupressus as Cupressus nootkatensis in 1824, it was transferred to Chamaecyparis in 1841 on the basis of its foliage being in flattened sprays, as in other Chamaecyparis, but unlike most (though not all) other Cupressus species. However, this placement does not fit with the morphology and phenology of the cones, which are far more like Cupressus, like them maturing in two years, not one. Genetic evidence, published by Gadek et al., strongly supported its return to Cupressus and exclusion from Chamaecyparis. More recently, Farjon et al. (2002) transferred it to a new genus Xanthocyparis, together with the newly discovered Vietnamese golden cypress Xanthocyparis vietnamensis; this species is remarkably similar to Nootka cypress and the treatment has many arguments in its favour, as while they are not related to Chamaecyparis, neither do they fit fully in Cupressus despite the many similarities. Little et al., while confirming the above relationship with further evidence, pointed out that an earlier nomenclatural combination in the genus Callitropsis existed, as Callitropsis nootkatensis (D.Don) Oerst., published in 1864 but overlooked or ignored by other subsequent authors. Little et al. therefore synonymised Xanthocyparis with Callitropsis, the correct name for these species under the ICBN when treated in a distinct genus. The name Xanthocyparis has now been proposed for conservation, and the 2011 International Botanical Congress followed that recommendation. In 2010, Mao et al. performed a more detailed molecular analysis and placed Nootka cypress back in Cupressus. However, this is disputed, as the tree would compose a monophyletic subgenus. "The argument that it warrants treatment as a monotypic genus is not without merit, in which case the correct name is Callitropsis nootkatensis." Nootka cypress is native to the west coast of North America, from the Kenai Peninsula in Alaska, south to the Klamath Mountains in northernmost California. It is typically occurring on wet sites in mountains, often close to the tree line, but sometimes also at lower altitudes. Cupressus nootkatensis is an evergreen tree growing up to 40 meters (133 feet) tall, commonly with pendulous branches. The foliage is in flat sprays, with dark green, 3–5 mm long scale-leaves. 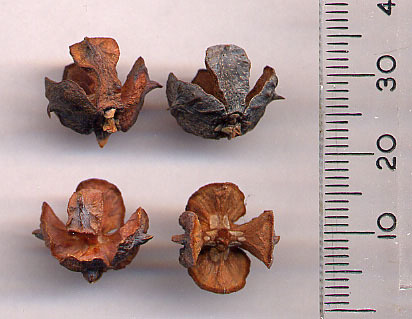 The cones have 4 (occasionally 6) scales, and resemble the cones of Mexican cypress (Cupressus lusitanica, another Cupressus species which can show foliage in flat sprays) fairly closely, except being somewhat smaller, typically 10–14 mm diameter; each scale has a pointed triangular bract about 1.5–2 mm long, again similar to other Cupressus and unlike the crescent-shaped, non-pointed bract on the scales of Chamaecyparis cones. The Caren Range on the west coast of British Columbia is home to the oldest Nootka cypress specimens in the world, with one specimen found to be 1,834 years old (Gymnosperm Database). Cupressus nootkatensis is one of the parents of the hybrid Leyland cypress; the other parent, Monterey cypress, is also in genus Cupressus, although in the North American Hesperocyparis clade, which has generally been found to be phylogenetically closer to C. nootkatensis than the Old World clade Cupressus sensu stricto (e.g., Mao et al. 2010). In Alaska, where the tree is primarily referred to as "yellow cedar," extensive research has been conducted into large-scale die-offs of yellow cedar stands. These studies have concluded that the tree has depended upon heavy coastal snowpacks to insulate its shallow roots from cold Arctic winters. The impacts of climate change have resulted in thinner, less-persistent snowpacks, in turn causing increased susceptibility to freeze damage. This mortality has been observed over 7% of the species range, covering approximately 10 degrees of latitude from northern southeast Alaska to southern British Columbia. Substantial future mortality is likely due to warming temperatures and decreasing snowpacks. The U.S. Fish & Wildlife Service is reviewing whether to designate the species as threatened or endangered. Young tree in North Cascades National Park. The various physical properties of the wood make it an attractive material for both general construction and boat building. Due to its slow growth it is hard and, like other cypress woods it is durable; it therefore offers good dimensional stability, and is resistant to weather, insects, and contact with soil. It works easily with hand or machine tools; it turns and carves quite well. It can be fastened with glues, screws, and nails. Nootka cypress's texture, uniform color, and straight grain will take a fine finish. It resists splintering and wears smoothly over time. When fresh cut it has a somewhat unpleasant bitter scent, but when seasoned it has barely any discernible scent, hence its traditional use in face masks. Due to its expense, it is used mainly for finished carpentry. Typical uses include exterior siding, shingles, decking, exposed beams, glue-laminated beams, paneling, cabinetry, and millwork. In historic preservation it can be used as a substitute for Thuja plicata (western red cedar) and Taxodium distichum (bald cypress), due to current difficulties in obtaining quality timber of those species due to environmental concern and past over-exploitation, although this applies equally to Nootka cypress. Other uses for Nootka cypress include saunas, and battery containers due to its resistance to acids. Traditionally, paddles, masks, dishes, and bows were made from the wood. The drooping branchlets give the tree a graceful weeping appearance. It makes an attractive specimen tree in parks and open spaces. It can also be used as a tall hedge. It will grow in USDA plant hardiness zones 5-9, but can be difficult to grow. Best growth is in light or heavy soil, preferably well drained, and in climates with cool summers. It prefers semi-shade to full sun. Nootka cypress can also be used in bonsai. The cultivar C. nootkatensis 'Pendula' has gained the Royal Horticultural Society's Award of Garden Merit. Nootka cypress has extreme heartwood qualities that make this one of the most desired sources of heat on the west coast. A dead tree can last up to 100 years for firewood. This wood burns very hot and lasts a long time as embers. The Nootka cypress is used extensively by the indigenous peoples of the Pacific Northwest Coast, along with another cypress, Thuja plicata (western red cedar). While western red cedar was preferred for larger projects (houses, canoes), Nootka cypress was used for smaller carvings such as vessels and utensils. A legend amongst the Nootka peoples of the Hesquiaht First Nation tells of the origins of the Nootka cypress. In the legend, a raven encounters three young women drying salmon on the beach. He asks the women if they are afraid of being alone, if they are afraid of bears, wolves, and other animals. Each women responded "no". But when asked about owls, the women were indeed afraid of owls. Hearing this, the trickster raven hid in the forests, and made the calls of an owl. The terrified women ran up the mountains, but turned into Nootka cypress trees when they were out of breath. According to the Nootka, this is why Nootka cypress grows on the sides of mountains, and also why the bark is silky like a woman's hair, the young trunk is smooth like a woman's body. In Tlingit culture the story of Natsilane describes how a Nootka cypress was used to carve the world's first killer whale. ^ a b Farjon, A., Hiep, N. T., Harder, D. K., Loc, P. K., & Averyanov, L. 2002. A new genus and species in the Cupressaceae (Coniferales) from northern Vietnam, Xanthocyparis vietnamensis. Novon 12: 179–189. ^ Mill, R. R. and Farjon, A. (2006). Proposal to conserve the name Xanthocyparis against Callitropsis Oerst. (Cupressaceeae). Taxon 55(1): 229-231. ^ Mao, K., Hao, G., Liu, J., Adams, R. P. & Milne, R. I. 2010: Diversification and biogeography of Juniperus (Cupressaceae): variable diversification rates and multiple intercontinental dispersals. - In New Phytologist. 188(1):254-272. ^ Earle, Christopher J., ed. (2018). "Cupressus". The Gymnosperm Database. ^ Earle, Christopher J., ed. (2018). "Cupressus nootkatensis". The Gymnosperm Database. ^ Sullivan, Steven. K. (2015). "Cupressus nootkatensis". Wildflower Search. Retrieved 2015-03-31. ^ "Cupressus nootkatensis". Natural Resources Conservation Service PLANTS Database. USDA. Retrieved 2015-03-31. ^ "Callitropsis nootkatensis". Jepson eFlora: Taxon page. Jepson Herbarium; University of California, Berkeley. 2015. Retrieved 2015-03-31. ^ "Yellow-cedar are dying in Alaska; scientists now know why". Portland, OR: USDA Forest Service, Pacific Northwest Research Station. February 1, 2012. ^ Rosen, Yereth (November 26, 2016). "New mapping shows extent of yellow-cedar die-off in Alaska; analysis forecasts big losses in the future". Anchorage Daily News. ^ "Yellow cedar (Calliptropsis nootkatensis)". ECOS Environmental Conservation Online System. U.S. Fish & Wildlife Service. Retrieved 9 February 2017. ^ Soley, Theresa (30 September 2016). "Endangered Alaska tree? Rapidly dying yellow cedar may be listed". Alaska Dispatch News. Retrieved 9 February 2017. ^ La Ganga, Maria L. (10 April 2015). "Alaska yellow cedar closer to Endangered Species Act protection". Los Angeles Times. Retrieved 9 February 2017. ^ "RHS Plant Selector - Cupressus nootkatensis 'Pendula'". Retrieved 3 July 2013. ^ "AGM Plants - Ornamental" (PDF). Royal Horticultural Society. July 2017. p. 108. Retrieved 10 March 2019. ^ Stewart, Hilary. (1984). Cedar: tree of life to the Northwest Coast Indians. Vancouver: Douglas & McIntyre. ISBN 0-88894-437-3. Zsolt Debreczy, Istvan Racz (2012). Kathy Musial (ed.). Conifers Around the World (1st ed.). DendroPress. p. 1089. ISBN 9632190610. This page was last edited on 10 March 2019, at 13:31 (UTC).